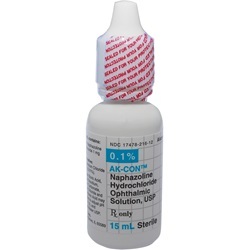 AK-Con Naphazoline Hydrochloride 0.1% ophthalmic drops in 15ml bottle. Manufactured by Akorn. NDC Number: 17478-216-12. Store drug at USP controlled room temperature.